The Libraries Taskforce reaches a significant milestone today in publishing our draft vision Libraries Deliver: an Ambition for Libraries in England 2016-2021. The document has been welcomed, including by William Sieghart, Chair of the Panel that produced the Independent Library Report for England (see end of the blog for quotes). This is an important step in the process that started with publication of the Independent library report for England in December 2014, Both that document and the Taskforce’s first six month progress report recommended the publication of a document that set out the government's and Taskforce's shared vision for public libraries in England. The Government strongly supported this recommendation and asked the Taskforce to produce a draft for consultation. The document reflects on the evolving role of libraries in light of changing public expectations. It presents a vision for the future and discusses how it should be achieved. Within the Taskforce, we’ve discussed and debated the contents of the Ambition document - what does it need to cover, what should the priorities be, how will the ambition be realised. Taskforce members have used their own knowledge and experience - as well as the intelligence and insights gathered through conversations with hundreds of people involved with libraries - to come up with the draft we’ve published today. But we recognise there are lots of people we haven’t managed to speak to yet. We want to give everyone with an interest in libraries - communities, library staff, partners, decision-makers - an opportunity to have their say on the priorities they believe will most make a difference to them and their libraries. How can you tell us what you think? We’ll also be holding a series of workshops around the country. You can see where they’ll be run and register your interest to take part here. You are also welcome to email us directly on librariestaskforce@culture.gov.uk or write to us. Once the consultation period closes, we’ll work with the Department for Culture, Media and Sport to review all the responses and publish the final document in summer 2016. 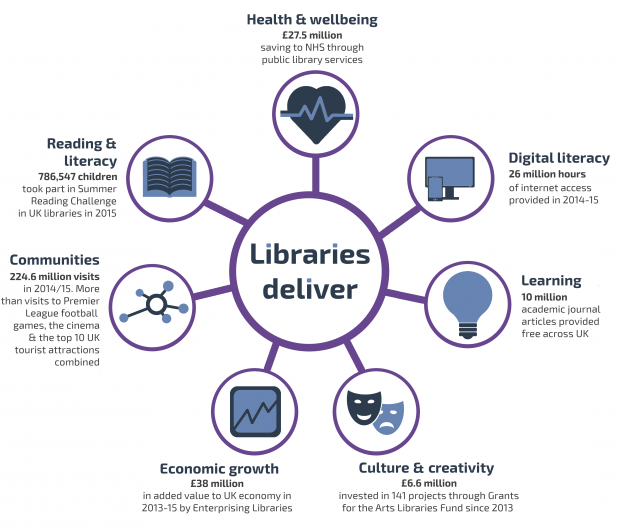 We all need to contribute to the debate about how libraries maximise their impact and value to their communities, and how local authorities can build a modern, comprehensive and efficient service within the resources that are available. We really hope to hear from you about what you think matters most in achieving this.